When exterminators use the terms "perimeter invaders" or "occasional invaders," they're referring to a wide variety of creatures who commonly live outside, but who occasionally make their way into buildings. There are literally hundreds of such creatures. We're just mentioning a few of them here. The species of earwigs most common in the United States average from about 1/4 inch to one inch (about 8 - 25 mm) in length when full-grown. They have tough but flexible, flattened bodies that enable them to hide in narrow crevices such as gaps under siding in buildings, or under rocks outdoors. Most species have wings as adults, but do not fly; but a few species can fly clumsily for short distances. 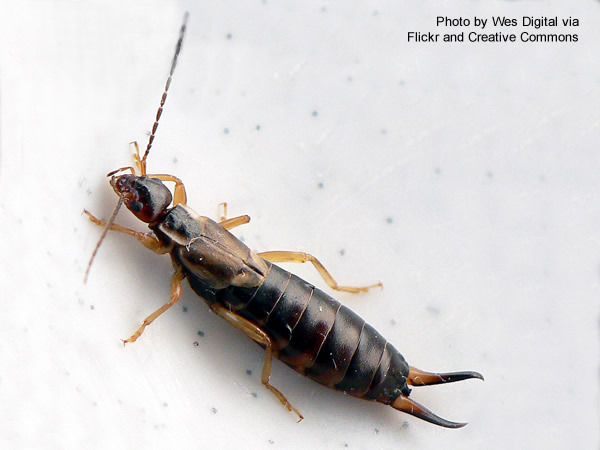 Despite the scary-looking pincers at the rear of their abdomens, earwigs are harmless. They don't intentionally crawl into people's ears, as an old English wives' tale taught. They're no more likely to crawl into someone's ear than any other insect. If they do happen to crawl into someone's ear, they don't make the person insane. Earwigs tend to live in moist areas that are protected from predators, such as under rocks or in organic mulch. They are scavengers for the most part, feeding mainly on decaying animal and plant matter. They're very common in gardens, dirt crawl spaces, and other damp areas with exposed soil and abundant hiding places. One interesting thing about earwigs is that they're one of the very few non-social insects in which mothers care for their young. Female earwigs diligently groom, care for, and defend their eggs; and continue to protect the newly-hatched nymphs and feed them regurgitated food at least through their second molt. Sowbugs (pictured here) and pillbugs are not really "bugs". They're not even insects. They're actually semi-aquatic crustaceans, and therefore are more closely related to lobsters than to insects. About 1/2 inch (about 13 mm) in length when full-grown, sowbugs and pillbugs have plated backs and resemble tiny armadillos. 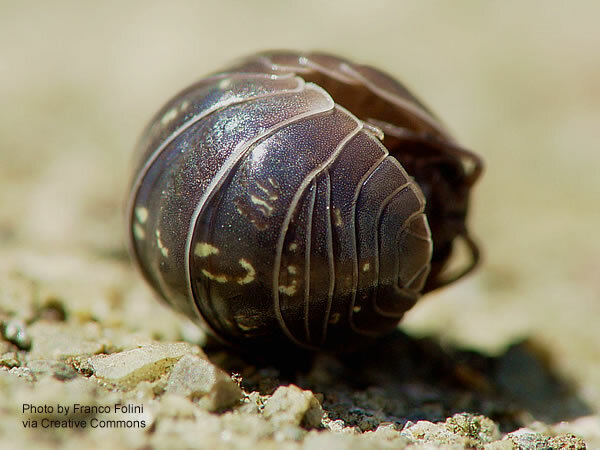 The most obvious difference between sowbugs and pillbugs is that pillbugs roll up into little balls when they're touched. Back in olden times, before video games were invented, children often called pillbugs "roly-poly bugs" for that reason and played with them. 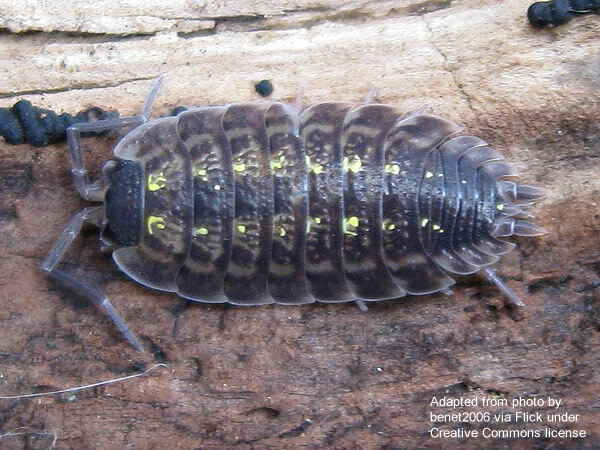 Both sowbugs and pillbugs are semi-aquatic and require fairly high moisture levels to survive. Outside homes, they typically nest under rocks, in rotting wood, in organic mulch, or under inorganic mulch. They typically wander into homes either during dry spells, when they're looking for moisture; or when rain saturates the ground, to avoid drowning. When sowbugs or pillpugs do wander into homes, they typically die of dehydration within a day or so if they can't find their way back outside. If they're only an occasional problem, sweeping them up may be all the control they need. Beetles, along with their snouted cousins the weevils, are members of taxonomic order Coleoptera, the most populous and successful order of animals on earth. In fact, one out of every five individual animals in the world is a beetle. 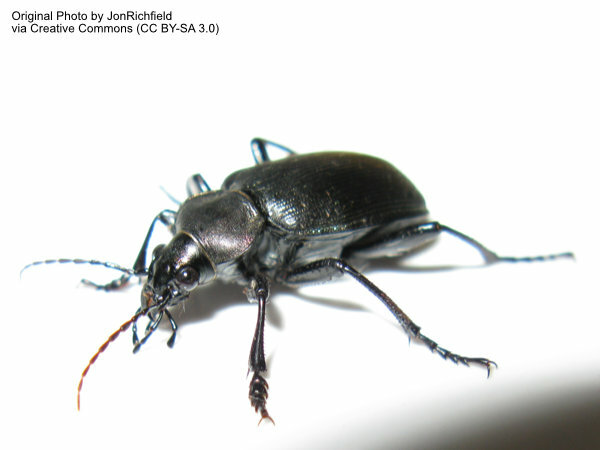 The beetle shown here is a common ground beetle. This and many other species of ground beetles sometimes enter homes and are often mistaken for cockroaches by frantic homeowners. But it is harmless. In fact, only a relatively few beetle species are at all significant as household pests. Chief among these would be those that damage wood or textiles (for example, carpet beetles) or those that infest stored food. The rest of the beetles are, at worst, a minor nuisance. A quick way to tell beetles from cockroaches is that cockroaches have wings that cross over each other at rest. Beetles and weevils either have leathery wing covers with longitudinal grooves like the ground beetle in the picture, or wing covers with a clearly visible longitudinal gap running right down the middle of their backs. As previously mentioned, weevils are basically beetles with snouts, many of which are significant agricultural and stored-food pests. The ones that live outside homes, however, rarely infest food inside homes. Weevils and beetles that infest stored foods almost always were introduced upstream, either in the manufacturing process, in transit, or at the supermarket. 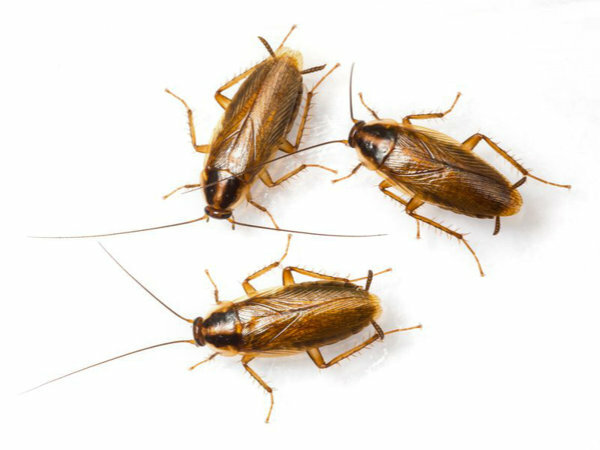 Once they're in your pantry, they may infest other food; but they almost always originated somewhere in the food supply chain, not outside your home. Generally speaking, the presence of perimeter invaders inside a house indicates that there is a moisture problem or a structural flaw (like cracks in the foundation or gaps between the foundation and the sill plate) around the perimeter outside a house. Most problems with perimeter invaders can be treated non-chemically by sealing openings in the buildings perimeter walls with high quality exterior caulking, rectifying moisture problems, cleaning up decaying organic matter, and substituting inorganic mulches for organic ones like wood chips or similar landscaping materials in the few feet of space around the building. Occasionally, however, perimeter invaders become a serious enough problem that chemical treatment is warranted. Even when pesticides are required, you should use the above non-chemical methods first. Pesticides should be considered supplemental to non-chemical measures, rather than the primary treatment. Perimeter invaders can be controlled with any high-quality perimeter insecticide applied around the building's perimeter. Usually, granular products sprinkled around the home in accordance with the label instructions are the simplest and most effective method for homeowners, but most liquid sprays are also effective against a broad spectrum of perimeter pests. Some perimeter invaders, particularly ants, crickets, and silverfish, respond well to high-quality granular insecticide baits like Maxforce Complete Brand Granular Insect Bait, which uses hydramethylnon as its active ingredient. There also are baits that use boric acid as their active ingredient, such as the Niban family of baits. Although slower-acting, boric acid is very effective and is considered essentially non-toxic. It's preferred by many people for those reasons. Whatever method you use, always read and follow the label instructions, making sure that the pesticide is registered for the specific pest, the area you wish to apply the insecticide to, and the method of application you are using. Always avoid the temptation to apply more insecticide than is specified on the label. Excessive application will not improve the products effectiveness, but it will increase the hazards to humans, wildlife, domestic animals, and ornamental plants.